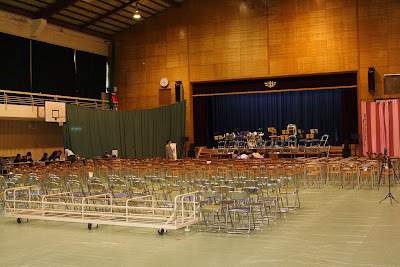 The hall where sports activities and performances are held. Do you ever get the feeling of your eyes forcing themselves to close and your head moving uncontroably, possibly ending up on the shoulder of the person sitting next to you, even for a while? Also, do you find yourself just before getting up, your body is annoyingly hard to move and that even the dimmest light that you first see very glaring? Wait, what am I talking about? Oh yes, I was saying that later on today, that the Jan 2008 intake of SC would take place over there. I have yet to get ready, but shouldn't be that difficult.